Large frame dagger-style fighting knife with full tang construction. The stainless steel blade includes partial spine serrations, blood groove and combat knife geometry. Black finished wooden panels are bolted to the blade tang for a comfortable grip. A nickle finger guard accents the black handle while preventing your hand from sliding forward. Includes a nylon sheath with belt loop, 18 in. overall. If you are looking for a cheap, poorly made knife, you found it in this one. The handle is three quarter of an inch thick, leaving a lot to be desired when gripped. Due to the very thin handle, the knife if top heave and off balance. Reminds me of a poor kitchen utensil knife. The only thing going for it, it has a sharp blade. If I had the time, I'd send this one back. Definitely not recommended. The blade is thin (maybe one eight of an inch thick) and poorly made. *The sheath itself leaves some to be desired. A button latch instead of Velcro and some rigid plastic lining the top would fix at least one other problem and add some quality. Verdict: 4 stars, I like it, but keep trying. Ok, for starters, its a very good blade. It's weighed well, and the balance is good on it. The look of it leaves no room for arguement. It says "I mean business" and nothing else. shipping, as usual, was on time. no complaints from me. The handle appears to be made of plastic at a glance, but upon further inspection you will see it's wood,with a high polished finish. This is a great knife, and is extremely sturdy, and came sharp. The sheathe is basic, and seems slightly large though the blade fits rather snug inside of it. The blade on the other hand was smaller than what I was expecting, though after I held it for a moment, I didn't care much. The blade is beautiful, cuts well and withstands a beating. This blade is longer than I anticipated. This is also the third buy off of TS. Wonderful as it is, I work in a machine shop and visualize steering pinions. So I found a few discrepancies that my OCD disapproves of. Nothing I can't overloo. My only real complaint is that the blade is dull; actually that's my roommate's complaint. It's stab worthy. I approve. Great knife, came a little dull but nothin some sharpenin can't fix :) Looks amazing, it's perfect for what i wanted, a bootknife with a kick! The handle is very slim but that's great for concealment. Note: The Blade parts of the knife are painted black, very cool! Very nice knife, looks intimidating and feels sturdy. 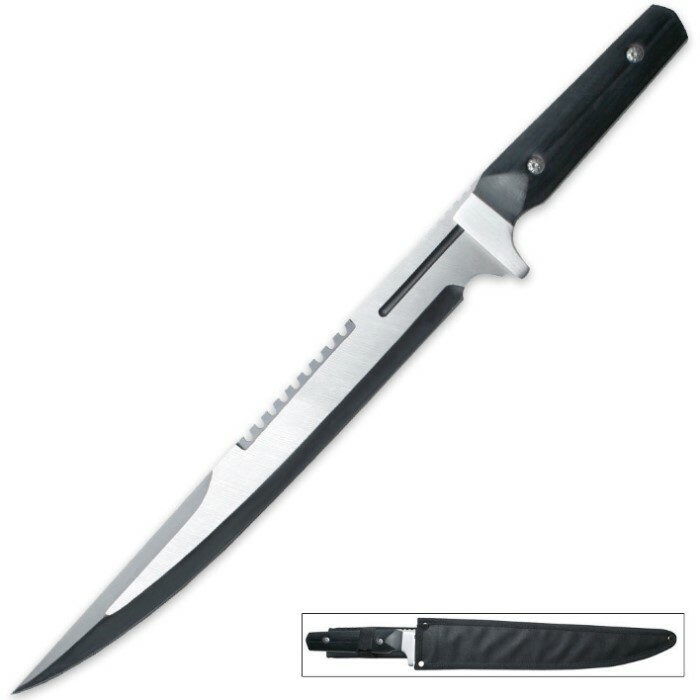 Has extremely sharp pointed tip and decently sharp blade all the way down. The only thing that gets me with this product is the handle is slimmer than expected not fit for bigger hands and the velcro strap is poor on the sheath. But great buy for the price! i like this knife but i am tempted to cutoff the Velcro.